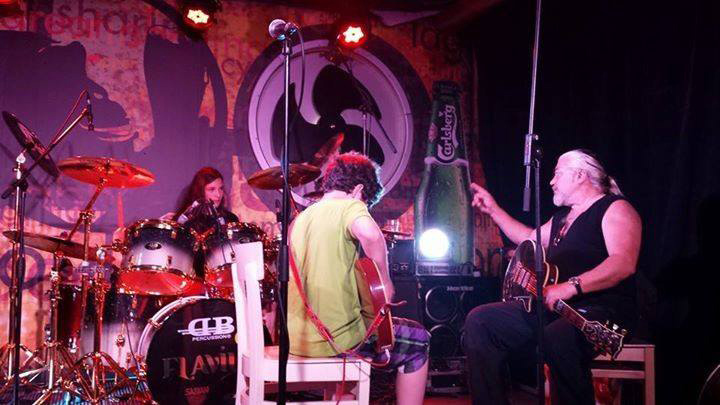 In October 2014 we met up with a band from Transylvania, Romania. EDITOR’S NOTE: For October, we start off with an extremely interesting interview with Nicu Covaci, the leader of a musical group known as PHOENIX. What makes this so special is that Nicu and his bandmates hail from Transylvania, Romania. This group is determined to kick off the very first Celtic Festival in Romania, planned for 2015, if all goes well and enough support is found. We plan to help them in any way we can. They have, as an additional goal, to reclaim the reputation of Vlad the Impaler – the inspiration for Bram Stocker’s novel, Dracula. CG: Welcome to the pages of Celtic Guide. Yours is a very interesting story. Can you tell us why you wish to establish the first Celtic Festival in Romania? 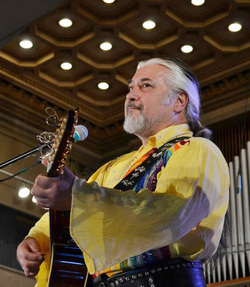 NICU: I started making music fifty years ago, in Romania. When we were young, we were influenced by all kinds of Western music – bands like the Shadows, the Byrds, and later, the Beatles. But in the 70s we found our own style, based on old Romanian folklore. Our folk heritage has a lot of Celtic music in it! In certain areas of Romania, like Transilvania (the Romanian spelling) or Maramures (a beautiful, traditional land in the north of the country), you can observe these influences if you know what you are looking for. I thought about a Celtic festival a few years ago, and my main goal is to let today’s Celts know you still have a few cousins here ! CG: Do you feel your own music has a touch of Celtic-ness to it? NICU: I made a few albums in the 70s, before leaving the country. Later when I studied my songs, after a lot of experience, I noticed that I used Celtic themes and influences when building them, without any knowledge or intention. Learning about Celtic music gave me the opportunity to see how my music has a lot in common with it - and how a lot of traditional songs from Romania have the same influence. We never learned this in school. No one ever told us. I also studied our history and found out incredible details about this connection. This is another reason why I wish to establish a Celtic festival – I was in love with this music without even knowing it ! CG: Are you finding any support from the government or other interested parties? NICU: This is the hardest part. We have everything we need – relationships with great musicians, support from international artists and mass media, a great plan – but we are still searching for sponsors and supporters. It will be the first edition and the public is not educated in this direction yet, and does not have a lot of information about Celtic culture. This is what we are trying to change. My personal problem with our government and our institutions (the ones responsible for representing us in other countries) is that they always send artists from other cultures and minorities to represent Romania at international festivals or music events. Don’t get me wrong, I have nothing against their artists. They have amazing talents. But this is not our culture ! We are partially Celts! Surprisingly, I have found support from complete strangers. I contacted artists and mass media representatives from Ireland and from the USA, and every one of them was excited to be a part of this and help us in anyway they can. This made me think it will be worth it, so I am still searching for sponsors. CG: We find that you are one of the only bands to have a history spanning over 50 years, besides the Rolling Stones. How has your music changed in that time? NICU: It is very challenging to keep a direction for over 50 years. PHOENIX is more than a band: it is now an idea, a concept, a philosophy. To understand us and our music, you must first understand the context that created us. We started in 1962, in a communist country. Ten or twelve years later, we became dangerous! We were five boys that gathered 50,000 people at one concert. And we defied everything. So the state authorities intuited the danger: they banned us. I got married in 1976 to a girlfriend from Amsterdam, because Romanian state authorities were trying to find something to send me to jail. In 1977, I returned home to get my instruments. And I did. The only thing they did not see coming was that, in the Marshall speaker boxes, the boys were hidden – my band members. I hid them in the speakers and crossed the state border, helping them escape from Romania, under illegal conditions. We could have died, if they discovered us. And that was the moment when we became myth: we did something no one thought possible. After this escape, we became an idea. PHOENIX represented not only a music band, but also an idea about rebellion, cultural values and about freedom. When I was able to return home, in 1990, I noticed that I had something more to care about: responsibility! Youths are so confused today, they’ve lost their values, and I am trying to keep the same direction. PHOENIX has had over 40 members in 50 years. We had international and recognized artists, and also local young artists. I now have a 14-year-old-drummer! He is a revelation in this country. Of course some things change, because of each band member’s personal interpretation or philosophy, but the main direction of the band always stays the same. I have composed over 150 songs for this band, in 50 years. My level of understanding has changed over the years and I learned a lot of things. Today, when I listen to my old songs from the 70s (my first folklore-Celtic influenced album), I am surprised and amused to see how childish but sincere it seems to me. My music is more complex and elevated now, but the concept is the same. We have a style, we have a message, and this is not allowed to change. CG: We understand that you also have been attempting to change the perception of Vlad the Impaler established by Irish author Bram Stoker in his novel Dracula. Can you tell us about your efforts in this regard? NICU: The legend of Dracula is based on the personality of Vlad the Impaler, but people do not actually know the whole story. I travelled a lot and noticed that people from Western countries always think he was a bloodthirsty sociopath, and the myth about Dracula is based on this quality. He actually did a lot for his country and changed our history. He was a great leader and his battle with the Ottoman Empire kept Europe safe for a long time. About the way he used to deal with things, our history states that during his time you could leave a bag of gold in the middle of the road and no one would have dared to steal it, because his punishments for thieves were extremely cruel. He impaled the traitors and the country’s enemies, as our leader, trying to scare the Ottoman Empire. And he actually succeeded in keeping them away for some time. I was fascinated by him because he is the only Christian fanatic I know. The Muslims have this: they believe so much, they are able to die for a religious idea. Vlad Tepes was actually a fanatic in the opposite way and he used every resource he had to fight the Ottoman Empire. So I built a story and screenplay and I wanted to present this idea, in a modern way: Vlad the Impaler makes a pact with the Devil and he is alive today. He travels through Europe with a motorcycle band and fights every bit of residue he can find from the old empire. He insisted with the question. I told them this is not what I am trying to present, a modern Dracula, a vampire from bedtime stories who finds young girls and bites their necks. This is about something else. He was a Christian fanatic, and he was more than that stereotype. At that point, I left, losing a few million dollars, of course, and the opportunity to make a movie, but that was not what I signed up for. It may be a coincidence, but I am working now on a new album called Vlad the Impaler. It is a collection of songs about our leaders from the Middle Ages and their efforts to keep their land and fight their enemies. CG: What is that one thing you’d like Celtic Guide readers to know about your band? NICU: I think we are a unique story not only because of our music, but also because of some cruel realities that happened in eastern countries. We may represent the only music band that risked everything to be free – free to make music. We paid huge prices for this, but our music is proof that it was all worth it. And now, after 52 years, I am working on a new album with my old friends and new ones, and I hope that someday I will sit in the audience and listen to a young, reborn PHOENIX band.